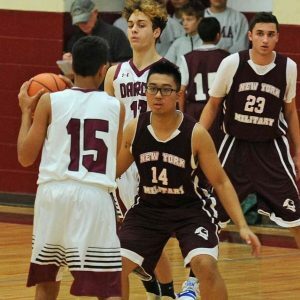 On Wednesday, 12/13, the Varsity Basketball team (2-2) traveled to Long Island to play Upper Room Christian and lost 87-71. The Knights were led by Zaahir Woody who finished with 24 points. Will Mayfield added 15 and Zamere McKenzie had 12. Brandon Evans, Karif Isaacs, Mickey Urso, and Josh Antoine added 6 points each. On Friday, 12/8, the Varsity boys traveled to Faith Christian Academy for a HVAL match-up. The Knights won by a score of 93-66. NYMA had a balanced scoring attack led by Zaahir Woody with 20 points, Will Mayfield and Zamere Mckenzie each had 18, and Josh Antoine added 10 points. On Wednesday, 12/13, the JV Basketball team played host to league rival Storm King. The Knights played very tough, but in the end they came up short losing 32-22. Cadets Bob Wang and Henri Racine both had outstanding games. These two teams will meet again in February at Storm King for what should make for another great game. The JV Boys, led by Coach Mario Espinoza, are now 2-1. The Varsity Boys will travel to Chase Collegiate on Saturday, 12/16. Both JV and Varsity are then back in action next Wednesday, 12/20 as they travel to NEPSAC powerhouse, St. Thomas More. NEW YORK MILITARY ACADEMY - Set Apart for Excellence. All rights reserved.